Did you have a good weekend? We had near springlike weather again but I was not able to enjoy it due to my daughter and I coming down with severe cases of the stomach flu. I'm feeling better now but am really behind on responding to your comments and visiting your blogs. I hope to get caught up soon! Cleaning is definitely not one of my favorite things to do. But, with spring just around the corner, the thought of opening windows and letting the fresh air drift in makes me want to do a deep spring clean. I'm starting with our laundry closet that is just off our kitchen. This has been a dumping ground for just about anything we didn't have a place for or were too lazy to bring down to the basement to store. This space was a mess! The first step was to empty out the entire closet. The random storage containers and boxes made it hard to know what was in there. So I went through each container to purge things that didn't belong, recycle empty bottles, get rid of unwanted items, etc. Next up was deep cleaning the washing machine, wiping down the shelves and the outside of the washer and dryer, vacuuming behind them, and cleaning out the dryer vent that leads outside. If we were not in a rent home, I would have re-lined the shelves and put a fresh coat of paint on walls to brighten this area up. For now, having it clean will have to do. You would expect your washing machine to be clean with all of the washing it does but it actually gets really grimy. To clean the inside of the washer I filled it with hot water, added a quart of bleach, let agitate for a few minutes then let it sit for one hour. When the hours up, run it through the longest wash cycle, fill it with hot water again and add a quart of distilled white vinegar. Let agitate for a few minutes then sit again for an hour and then run through the longest wash cycle again. Finally one thing I don't mind doing, organizing. I picked up bins at Dollar Tree for $1 each and used chalkboard labels left over from a summer party to label the contents of each bin. I organized by laundry supplies,extra cleaning supplies, pet supplies, rags, light bulbs, powder room towels, etc. If it was something that we haven't used in the past year, it was purged. Once everything was organized, it went back on the shelf. I came across this cute laundry printable to hang on the wall here. 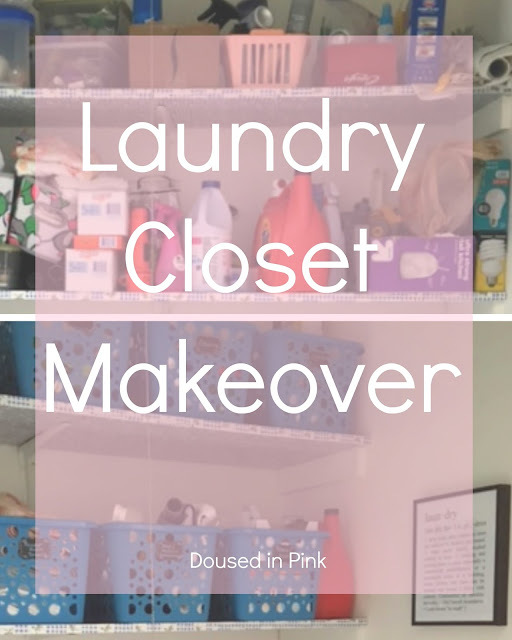 Now our laundry closet is organized and functional again and it only took a few hours!